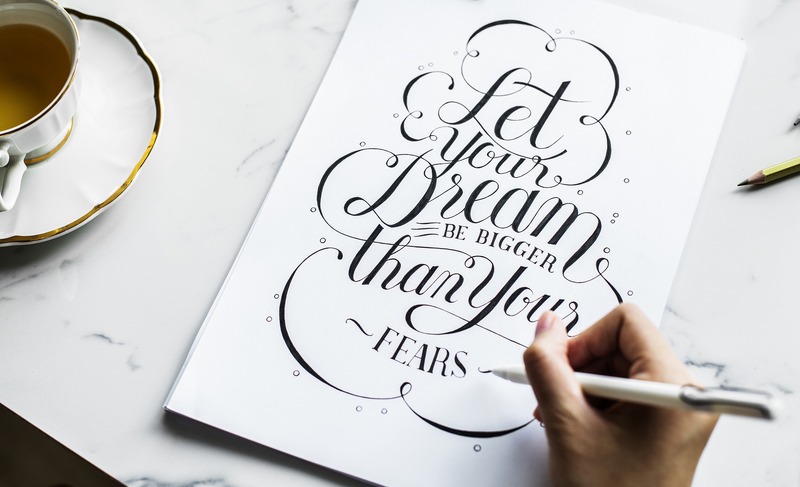 First and foremost, let’s get you equipped to begin your calligraphy journey and at The Art Shop Skipton, we have all the essentials to develop your writing skills further. We also know that it can be quite hard deciphering one tool from the next, so our resident calligraphers have made things easy with this Beginners Kit and Manual. Now that you’re prepped with the tools, let’s start with the basics although it may seem pretty obvious. In calligraphy, this is known as ‘the strokes’ and what letters are always made up of. Basic strokes are the foundation of this magnificent penmanship and they usually begin with an entrance stroke, a thin upstroke with light pressure. When it comes to perfecting your calligraphy strokes it’s key to get your form just right. Because a dip pen is actually different from holding an everyday ordinary pen. Start with a relaxed grip and a slight bend to your index finger. The pen should also be supported, not controlled, by your thumb, index, and middle fingers. Keeping hold of your pen make sure the tip points towards the top of your paper then keep upstrokes light and downstrokes heavy for thick and thin variation. We wish there was a magic potion that would make us really great at calligraphy but unfortunately, this wizardry only occurs with a good pen and lots of practice. Now that you’ve got the kit and you're ready to take your writing to the next level, the next step is practice, practice and oh - don’t forget lot’s more practice! Currently, there are over three billion users active on social media so why not take advantage of this and start making some new connections? Instagram is great for honing your skills by following related hashtags. And if you see something you like, drop that person a message to immerse in the calligraphy community! We very much hope you’ve enjoyed our post about this addictive craft. If you’re inspired to start and would like some pointers our team are always happy to help. If we could share one last tip it would be to never compare yourself to other lettering artists. Because you are you and your calligraphy style is exclusively yours alone. Thank you for reading.